Has Lamborghini built a better baby Bull? Here I am in the new Lamborghini Huracán, waiting for the light at the end of the Ascari circuit's pit lane to jump from red to green. My hands are trembling like I've just drunk a litre of espressos; the anticipation of driving the long-awaited baby Lambo is too much. But these initial quiet moments offer a good chance to take in the all-new interior. Despite being longer and wider than the Gallardo it replaces, claustrophobes need not apply, as the narrow bucket seat restricts movement and the small windows allow little of the streaming Spanish sun into the cabin. The windscreen stretches seemingly all the way to your feet, but the rear-view mirror is full of V10 heat haze and over-the-shoulder visibility is nil. The ultra-modern dashboard steals plenty of styling cues from its Aventador big brother, but takes a further leap into the future with the full TFT instrument display from the next-generation Audi TT. Able to show vehicle data, infotainment and Sat-Nav information or a mixture of the two, the system renders a traditional centre screen redundant. The centre console accommodates a set of buttons and dials instantly familiar to any Audi owner, a row of classic rocker switches for electric windows, hydraulic nose lift, ESP and the like and, hidden beneath a red cover, the all-important starter button. 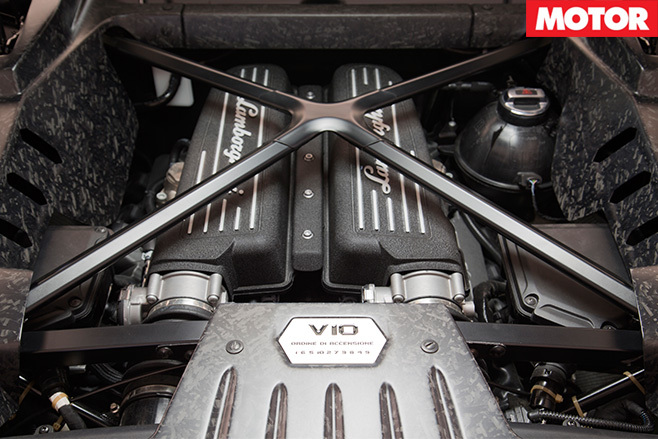 Press and hold it for a second or two and the starter motor whirrs theatrically before the 5.2-litre V10 catches with a roar. The uprated 5204cc engine produces 449kW/560Nm, increases of 30kW/20Nm over the last-of-the-line Gallardos. All-wheel drive transfers the power to the ground and enables this baby bull to hit 100km/h in a launch control-assisted 3.2sec and keep charging all the way to 325km/h. "Right now, we have a small advantage over the Ferrari 458," claims Lamborghini chief engineer Maurizio Reggiani, "but the next round of updates will almost certainly produce a new leader of the pack." 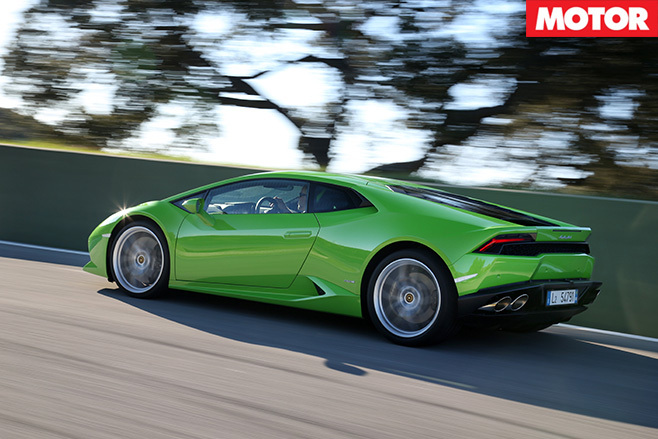 Aware the Huracán can only just hang on to the likes of the McLaren 650S and Porsche 911 Turbo S, let alone next year's Ferrari 458-T, the Italians have added a large dollop of pantomime to proceedings. 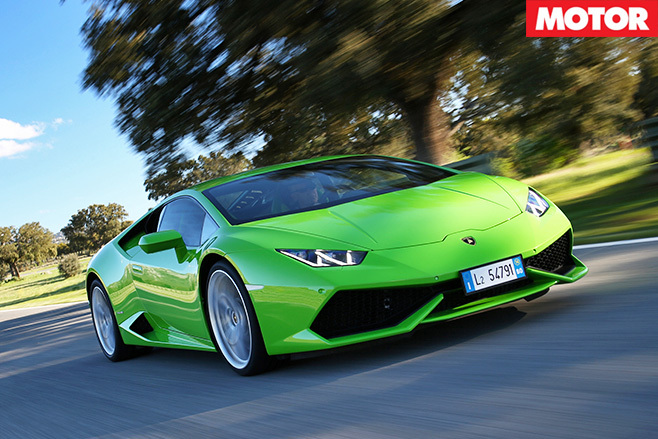 But though this Lamborghini can bark louder than most of its rivals, its personality is now more mature and less aggressive. Case in point is the new Lamborghini Doppia Frizione (LDF, Lambo-speak for dual-clutch) gearbox, which bites harder and faster than the Gallardo's dreaded e-gear single-clutch 'box yet, at the same time, can be totally fluent and seamless. 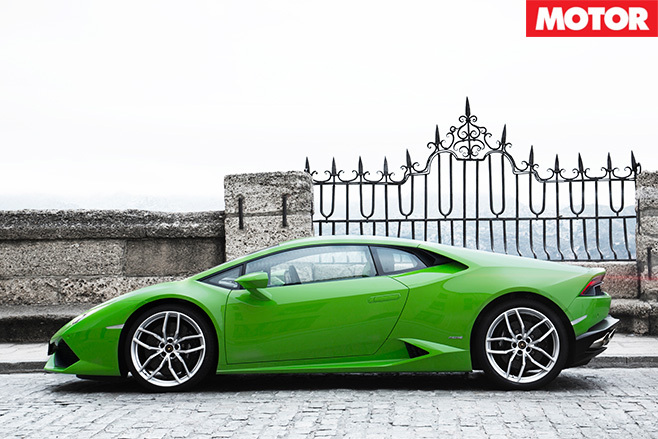 Even more so than the Aventador, the Huracán is two cars in one, and key to this split personality is the new 'Anima' system. This enables drivers to choose from three drive modes – Strada, Sport or Corsa – which tweak everything from throttle response and gearshift speed to the (optional) MagneRide dampers and Dynamic Steering. It's these last two features that are arguably the most controversial of Sant'Agata's new charger. Unlike the standard electro-mechanical system, Dynamic Steering varies its ratio depending on road speed, from a super sharp 9:1 around town to a relaxed 17:1 at autobahn velocity. In addition, it's able to make tiny corrections to combat under or oversteer. Where better to test all this than the torturous twists and turns of the Ascari race resort on the hills above the Costa Del Sol? With no ability to mix and match Anima settings – "we don't want to confuse the driver," says Reggiani – it's straight into 'Corsa' and into the fray. In more ways than one, the Huracán is still living in the past, but in the case of this glorious V10, we're more than happy to ignore progress. It's a rare gem, free-revving to between 8200 and 8500rpm (depending on gear selected) with throttle response like a razor's edge. Corsa mode engaged, the LDF gearbox fires through changes with whiplash ferocity and while the all-wheel drive system is clearly a bonus as far as traction and stability are concerned, the freedom of a racetrack brings its otherwise well-concealed tail-out antics to the fore. No more than 50 per cent of the power can be diverted to the front wheels and 100 per cent rear-drive is a possibility under certain conditions. A mechanical limited-slip rear diff provides extra grip. The speed is savage, but it's the car's balance and composure that offers further evidence Lambo's entry-level fighter has found a new level of maturity. On the same turf three weeks earlier McLaren's 650S was all exaggeration and tail-out excitement, yet this new Lamborghini, once a role model for extrovert excess, is totally predictable all the way up to – and beyond – the limit. Initially, the ESC seems overzealous, but after 20-odd laps, as the tyres start to melt and the car begins to fishtail out of second- and third-gear bends, the calibration is suddenly spot on. By this time the huge carbon-ceramic brakes are hot enough that the braking markers can be treated with disdain, but even as the giant bespoke Pirellis (245/30 ZR20 fronts; 305/30 ZR20 rears) begin their funeral march the interaction between man and machine remains unfazed. Safe and sure-footed like a 911 Turbo S, you can push seven-tenths in this Lambo and still feel like a superhero in the twisty stuff, overdrive it and not be punished as long as ESC is active, yet expect total satisfaction when nailing a 10-10ths lap. With a wide grin, Reggiani confirms this character was not the result of a happy accident: "For the sign-off drive with the board of directors from Ingolstadt, the car had to master a certain bend on the proving ground at almost 320km/h. Early on in the gestation process, it didn't. But after we increased the downforce by 50 per cent, even our German friends were convinced." 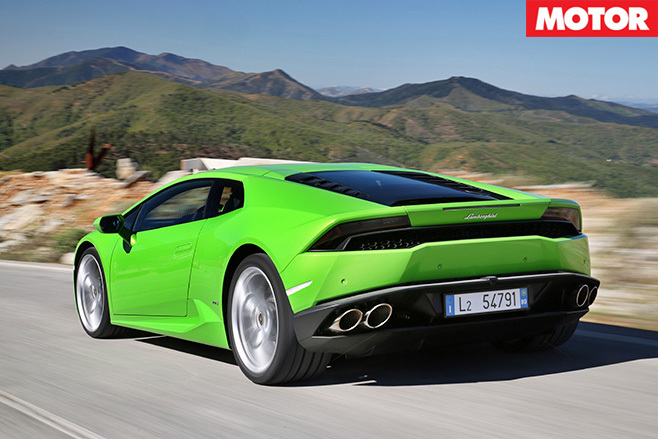 Though unable to secure the funds to develop an all-new segment-topping carbon-fibre structure, Lamborghini created its own version of the VW Group's Modular Sports car System (MSS) that will also underpin the next-generation Audi R8, the range-topping version of which will also share the Huracán's V10 engine. The platform is a curious mix of materials, with an aluminium spaceframe strengthened using a carbonfibre 'spine', which incorporates sills, floorpan, transmission tunnel, rear firewall and B-pillars. 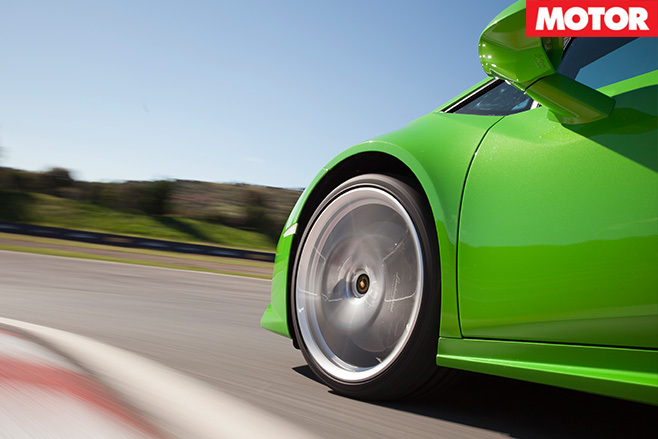 Torsional rigidity is 50 per cent greater than the Gallardo while weight is trimmed eight kilos to 1422kg. The next morning, an opportunity to try the Huracán on the famous Marbella to Ronda hillclimb route prompts a dawn getaway. Out on the road, away from the extreme velocities of the racetrack, the driving experience is no less beguiling. The spontaneous urge of that iconic V10 effortlessly fires us past slower traffic, the all-wheel drive system redistributes the torque corner-by-corner with surgical precision, the variable-rate steering carves out the most pragmatic flight path, the MagneRide dampers smooth out craters and the tireless brakes haul us in from the brink time and time again. 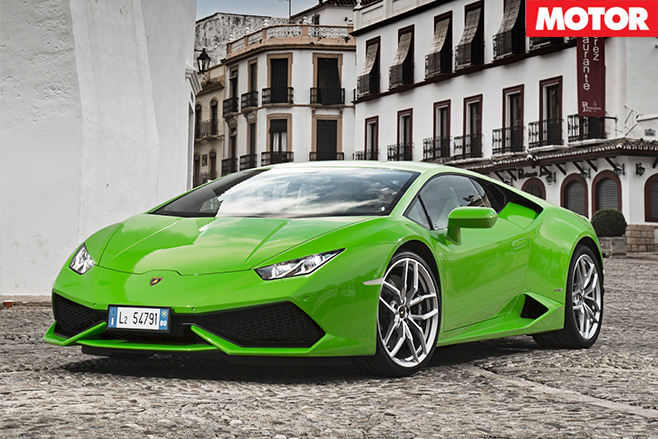 The greatest challenge the Huracán presents on the public road is operating the most basic of everyday functions. 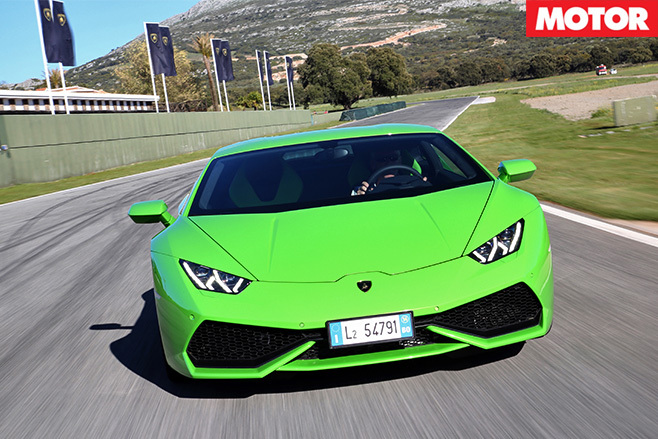 Like Ferrari, Lamborghini has moved the wiper and indicator controls to the face of the steering wheel, liberating space for a gigantic pair of shift paddles to be mounted to the steering column, and the reorganisation does require some acclimatisation. Complaints are few. More space for larger drivers, and the claustrophobic, would be welcome, and smartphone connectivity is far from state-of-the-art in a car that is expected to top $400,000 when it lands in Australia later this year. But such petty issues fade from importance when considering the bigger picture. The Huracán's soundtrack will silence the busiest street cafés, its concept-car looks make it a magnet for the smartphone paparazzi and its presence in the rear-view mirror will cut a swathe through even the heaviest peak-hour traffic. It's arguably the most successful marriage yet between Italian character and German efficiency. If you like your Lambos coarse, loose and unrefined, go and look for a brutish pre-facelift Gallardo. But if precise handling is as important as making a wave on the approach to the golf/yacht/tennis club, check out the Huracán, whose talents are much more than skin deep.